Happy Kitchen Sink Stamps Monday! This week Kitchen Sink Stamps is the Sponsor of CPS 185, and the KSS Crew is playing along to give you added inspiration using the sketch. Here's this weeks CPS Sketch, it's a really simple sketch, that I see myself using again, as many images will work with the layout. If you are in the Houston Area, or are up for a little Road Trip - check out the details on the Kitchen Sink Stamps Multi Step Stamping Workshop being held in Houston October 8th and 9th. Awesome interpretation of the sketch. Love the stitching around the edges and your papers are perfect with the Elephant! Awesome card! I luv your take on the sketch and the sewing adds so much!! Aww! This is just so cute, Lisa!! Love all the mix of papers and the distressing!! Love it, this is so adorable and I love the sewing (my new machine arrives tomorrow...oh how I've missed the sewing). Great colors and I love that this is a baby card-so cute! Love this gorgeous mix of papers stitched down so beautifully! How perfect for this sweet little elephant!! What a sensational card, Lisa!! Wonderful card. Love how you pieced those beautiful papers together. You sew too!!! 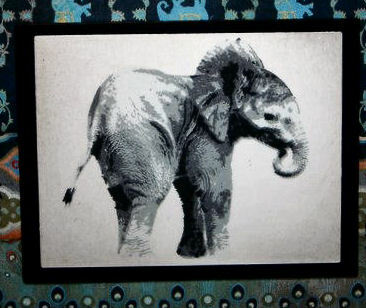 That elephant is so adorable, can't wait til mine gets here. Oh Lisa, this is super fantastic!! I love your take on the sketch and pretty DPs with the elephant image. Wonderful stitching detail too! fabulous card Lisa... the DP all go so well together... awesome sewing too! awesome job! This is very pretty! I love the papers you used! Great job with CPS 185! !